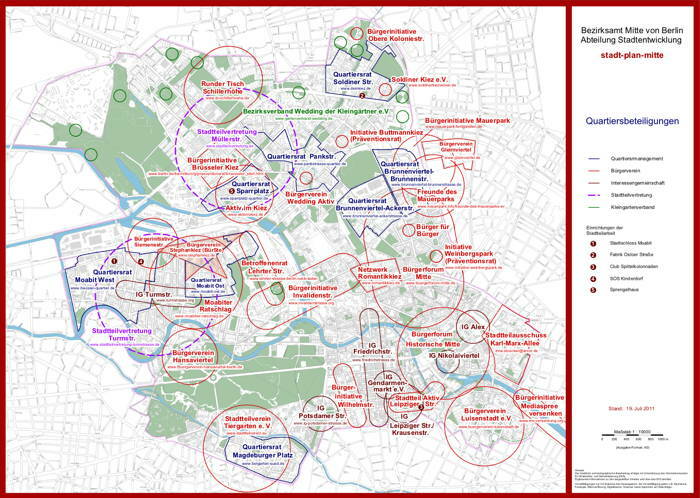 As one of his last acts in office, Ephraim Gothe, Mitte's Councillor for Urban Development, has created a map of all the local initiatives in his constituency. During his five years in office, Herr Gothe has worked towards opening lines of communication between local initiatives and government. The map is an important statement of intent that values local engagement. It is a good first step towards improving local participation, and creating a constructive dialogue. I hope this attitude starts to spill over into Berlin's civil service. During our seven year campaign with the Burgerinititave Invaldienstrasse (BII) we were often well supported by politicians at the borough level. Unfortunately Frau Junge-Reiher, the Senator for Urban Development responsible for the project at the regional level, refused to negotiate with us. The branch of the civil service (Senatsverwaltung) responsible for executing the plan was equally unwilling to co-operate with us to find a better solution. Our proposals would have saved Berlin millions of euros, and still handled the amount of traffic required by their plan. I still cannot figure out why they refused to work constructively with us. The complex and expensive public participation song and dance had almost no effect on the final plan, or the attitudes of the bureaucrats behind it. There is already enough lip service participation built into the system now, what we need is a responsive, intelligent and engaged civil service. This map is a good first step. The map has since been published online, you can download it from the senatsverwaltung. Thanks Florian for posting the link.